Description Printed in sepia. Size 59cm x 42cm (23" x 16"). 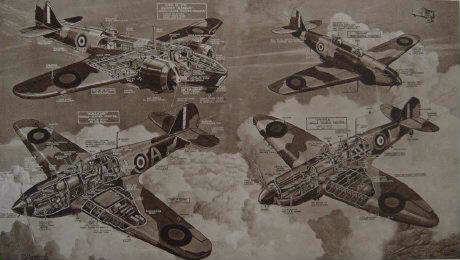 The Hurricane (fighter), Spitfire (fighter), Defiant (night fighter), Blenheim (bomber-fighter) with diagrams explaining the construction and operation.